You cannot visit Yellowstone National Park without visiting Old Faithful Geyser. Sure, everyone sees Old Faithful erupt, at least once. Chances are you’ll be standing with a crowd of several hundred people waiting and watching. Old Faithful is still the most frequently erupting and reliable of the big geysers in the world. It is the pulsing heart of Yellowstone, the park’s icon, and a global symbol of natural forces. So, of course, it’s a must see. But did you know that Old Faithful has two types of eruptions? The picture above is from a major eruption, where the column of steaming water climbs over 200 feet (65 meters) into the air. Most impressive. However, there is also a minor eruption, where the height of the geyser may struggle to reach 100 feet (35 meters). Less impressive. Some people can be disappointed in Old Faithful when they’re waited to see a minor eruption on a cloudy day. While predicting the type of Old Faithful Geyser eruption is imprecise, the rule of thumb is that the longer the time between eruptions, the more likely it will be a major eruption. So anybody can see Old Faithful erupt, but catching it at its best may take some effort. INSIDER TIP: It would be a shame to think of Old Faithful as the only must see in its neighborhood. There are more than 200 geysers in the Upper Geyser Basin, and Old Faithful is just one of them. If time is short, a walk around Geyser Hill, which is across the Firehole River from Old Faithful, brings you close to a number of famous geysers (Beehive, Lion, Giantess) and other thermal features. Otherwise, what we here at Yellowstone Insider call the “Firehole Walk” — from Old Faithful Inn to Morning Glory Pool, passing by Grand Geyser–provides better chances to see a major geyser erupt (Daisy, Grand, Castle, Riverside, Giant, Grotto) along with the opportunity to see scores of other named thermal features. The Grand Canyon of the Yellowstone River is breathtaking, and it really is made of “yellow stone,” but that’s not what sets this must-see apart. It’s a magnificent canyon with not one but two great waterfalls: The Upper and Lower Falls of the Yellowstone River. The Lower Falls (308 ft/ 94m) is the largest in the Rocky Mountains. The falls and the canyon can be accessed by either the North or South Rim Drive. If pinched for time, the prime view of the Canyon and Lower Falls is from Artist Point on the South Rim Drive. If you have the time and physical strength, hike one of the “Brink” trails to stand at the very edge of either the Upper or Lower Falls, an unforgettable experience. Yellowstone Lake doesn’t have the drama of an erupting geyser, nor the force of the waterfalls in the Grand Canyon of the Yellowstone, but it holds the third position in things to see in Yellowstone by its sheer scope and majestic surroundings. It’s the second largest lake in the world at high elevation and the only one that isn’t civilized — surrounded by lots of development. Other than the park highways that skirt the western and northern ends of the lake, this whole vast basin of water is without lakeside roads — and few trails. Its depths hold volcanic craters and spires of thermal cones, and it is just beginning to be discovered. This is a must-see to explore the beach somewhere and soak up the atmosphere of a great lake. INSIDER TIP: Explore the shore of Yellowstone Lake at Fishing Bridge. For something civilized, get an ice cream cone or snack at the General Store and head across the road to the Fishing Bridge Museum. Behind the museum is a fine strand of sand with trees for shade, a few benches, and glorious vistas of lake and mountains. For something less populated, try the Pelican Creek nature trail, located on the East Entrance Road about 2 miles east of Fishing Bridge. The Beartooth Highway from Red Lodge to Cooke City, Montana is one of the most spectacular and renowned mountain roads in the United States. It traverses some of the largest of high plateaus in North America, crosses the Beartooth Pass at 10,974 ft / 3,345 m, and provides awe-striking vistas of deep canyons and snow covered mountains. It is an official “All American Road” that was called “…the most beautiful drive in America” by the late CBS correspondent of On the Road, Charles Kuralt. Nothing surpasses the Beartooth Highway for an alpine experience by car. INSIDER TIP: Take a few moments anywhere between the Beartooth Pass (West Summit) and the East Summit (where the ski lift is located) and get out of the car, smell the cool mountain air, kick some snow (before August), hop a few rocks, and commune with the marmots (largish bushy-tailed critters that look like woodchucks). If the alpine flowers are in bloom, drop down on the prayer bones and look at them closely and then look out to the fields of color they can create. Weather permitting, lie down in the meadows and count clouds, or break out into a loud stanza of “The Hills are Alive”…or something. Few mountain ranges anywhere in the world rise more dramatically than the Grand Tetons from Jackson Hole. Grand Teton National Park is, of course, a major destination in its own right and certainly a must see for those going to or from Yellowstone from the south. This is some of the most photographed scenery in the country and the backdrop for numerous movies (think Shane). It also has a pearl-chain string of beautiful lakes, numerous mountain trails, and the fishing mecca of the Snake River. INSIDER TIP: Leave the main highway (U.S. 89) at either Jackson Lake Junction or Moose and travel the Teton Park Road. This brings you as close to the mountains as you can get without hiking into them. The Cathedral Group (Grand Teton, Mt. Owen, and Mt. Teewinot) rise over a mile (from 6,784 to 13,766) seemingly straight up. Reflected in the waters of String or Jenny Lake these mountains make unforgettable images (in your head or in a camera). On a warm and sunny day, a picnic at String Lake is a special experience. There is no better place to get an overview of the Greater Yellowstone Region: geology, natural history, and human history. Not to mention the colorful life of “Buffalo Bill” Cody, to whom the center is dedicated. 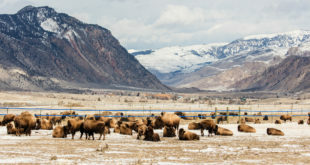 Located on the west side of Cody, Wyoming, this is one of the limited number of museums in the country worth a visit in its own right — providing, of course, that you don’t mind spending a full day in a museum. Keep up with the latest in Yellowstone National Park news with our free weekly Yellowstone Insider newsletter. Subscribe today! More details here. We’ve also set up a free Twitter account so you can receive updates on the device of your choice.